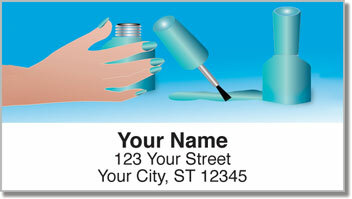 Give your outgoing mail some extra polish and use these colorful address labels on everything you send! Whether you apply nail polish yourself, or get an amazing manicure at the beauty shop - a little flair for your fingers does wonders to boost your mood! Your hands are elegant, graceful and caring. So why not show them a little tender love and care? 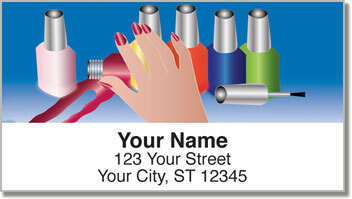 Every time you sit down to fill out an envelope, Sassy Nails Address Labels will remind you to schedule time to pamper yourself. The best part is preparing that mail won't take long. 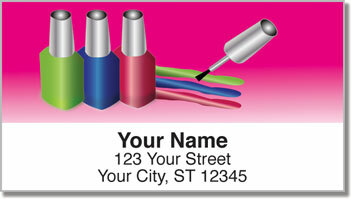 The self-adhesive backing on our labels eliminates the annoying task of writing your name and address on every envelope. 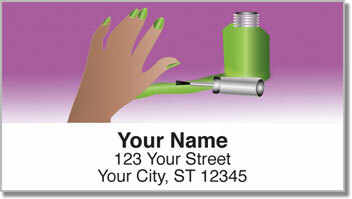 Order your very own Sassy Nails Address Labels right now! They also come in matching personal checks.